The digital marketing landscape changes a little bit every day, but one thing stays intact: email continues to be the most effective channel. It has the highest median ROI of 122 percent, which is four times higher than other widely used marketing channels such as paid search, social media, and direct mail, combined! No wonder email marketing spending in the U.S. is projected to reach $3.07 billion in 2019, which is a significant increase from the current value of $2.87 billion, according to Statista. More and more businesses recognize the effectiveness of emails to bring more traffic and increase eCommerce sales, so having a documented strategy has become a must in online business. A wide popularity of email marketing means that your business needs to move beyond the basics such as creating appealing visual and using simple personalization and focus on more advanced strategies that can maximize your conversions and sales, and also help with building a large base of engaged customers. In this article, we’re going to reveal these strategies so you know how to up your email marketing game and outperform the ever-increasing competition. They include the following. If your company has been using email marketing until this point, chances are that you’ve mastered basic personalization techniques such as adding a customer’s name to the subject line. At this point, it’s time to improve your personalization by making your emails even more custom. Your customers will be delighted if you do so. According to State of Personalization in Email report, 55 percent of email recipients want brands to provide them with more targeted promotions and discounts while 37 percent want recommendations based on their interests. That’s huge. One way to improve your email personalization is to create a loyalty program and invite people who have interacted with your marketing messages before. By doing so, you’re demonstrating that you appreciate their business and cultivate the relationships with them further (and drive them to your website, of course). For example, here’s how a popular online clothing retailer Rue La La does it. The email below makes an exclusive offer to sign up for a one-year premium membership for free and enjoy such benefits as free 2-day shipping, free returns, and others. It’s a known fact that people spend a little bit more than usual around holidays, so you should definitely take advantage of special occasions. If you’re an owner of an eCommerce business, you must do your best to increase your sales during the holiday season because it’s such an excellent chance to boost your business. 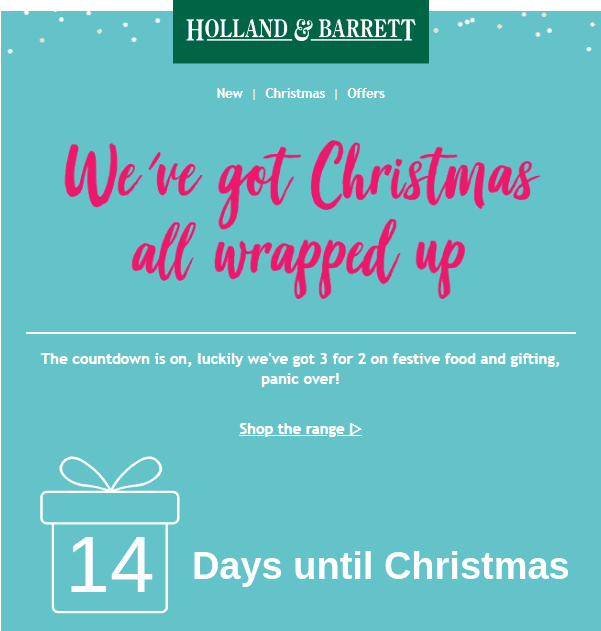 To make a long story short, you have to design and distribute holiday-themed emails with special offers to encourage your subscribers to go to your website. For example, here’s how a British health retailer Holland & Barrett does it. The company actually employs a smart strategy by starting the holiday email campaign 14 days prior to Christmas. It thus gives them a chance to make special offers every day and maximize their conversions. Transactional emails – order confirmations, product recommendations, and payment receipts – can be highly useful for you. “Since they’re commonly considered the most relevant emails that a business can send to a customer, they provide an excellent opportunity to drive more value and engagement,” says Neightan White, a digital marketer from Supreme Dissertations. 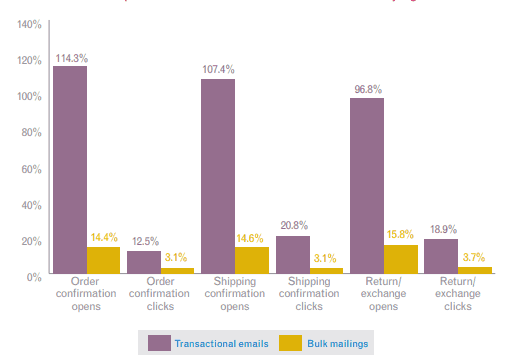 In fact, this recent report suggests that transactional emails’ open and click rates are a lot higher than ordinary emails. Since transactional emails are triggered by customer behavior such as account creation, a purchase, free sign-up for a trial of a product or service etc., you need to have an appropriate email marketing tool in place to be able to send them at the right time. 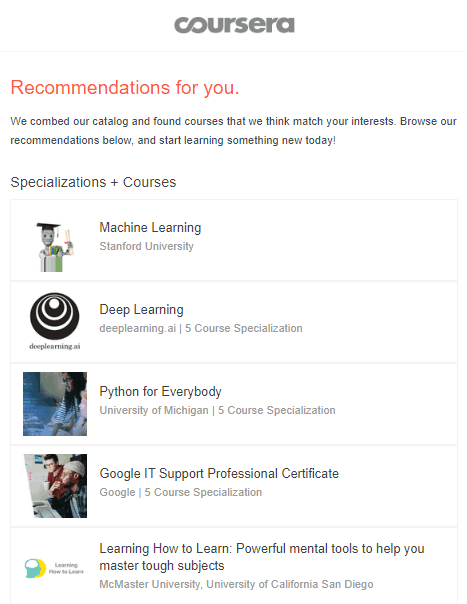 For example, here’s an email sent by a popular online learning platform Coursera, offering course recommendations based on the recipient’s previous purchase. 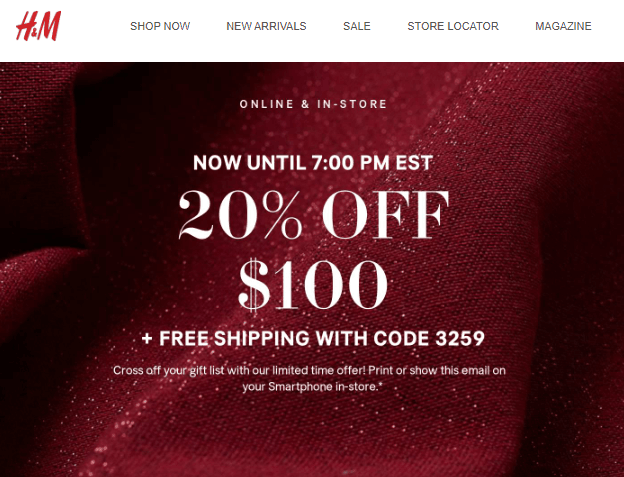 This is a must-do email for eCommerce businesses that have frequent sales. One of the reasons why people subscribed to your newsletter is to be the first to hear about great offers, so it’s your obligation to let them know as soon as possible. Here’s an excellent example of a sale notification from a well-known clothing brand H&M that had “ALERT! Now until 7pm…20% off + free shipping!” as the subject line to entice the recipients to open it. Indeed, it’s a good deal that has a lot of value for the customers. H&M did a great job with this email because the promotion details are both in the subject line and the body of the email. Since it’s the primary reason why customers would click on the email, hiding the offer is simply pointless. Next, the email allows the viewers to visit the page of the sale and other store’s departments and sections (New Arrivalsetc.) so they can quickly go to what they want, which is also a good decision. In other words, this email is packed with value for customers, so your business should also send out similar messages. 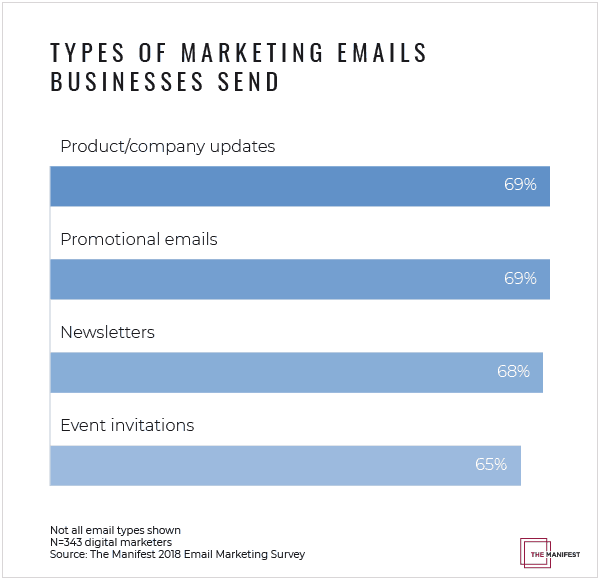 According to the State of Email Marketing in 2018 report, promotional emails comprise a large share of marketing emails, so a lot of businesses share them with their customers. Email Subject Line Grader. Test your email subject line and get a score as well as research-based improvement recommendations. HotEssayService. Get your email copies proofread by marketing professionals. BeeFree. Free online email editor for creation of responsive emails. RewardedEssay. Quality email marketing writing and editing. GrabMyEssay. Get personalized recommendations for email copies, call to actions, and subject lines. Gimmio. Create professional email signatures for your whole team. These are the ways to boost your online sales with email marketing. They represent advanced techniques that you should definitely try to improve customer engagement and their interest in your brand. 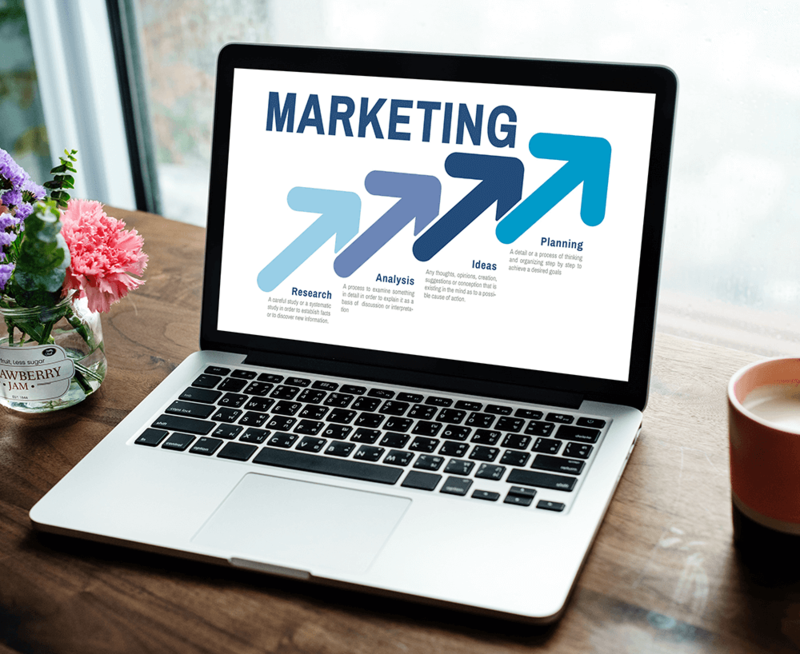 It’s over to you now, just remember one thing: becoming successful with email marketing is a process that involves a combination of planning and analysis to constantly improve your campaigns. Hope you have a great journey! Bridgette Hernandez is a Master in Anthropology who is interested in writing and planning to publish her own book in the nearest future.The texts she writes are always informative, based on a qualitative research but nevertheless pleasant to read.